Beavers are one of nature's architects, building elaborate dams that back up rivers and streams to create ponds and change the ecosystem around them. They are powerful swimmers but vulnerable to attack when on land searching for food. To help them hide from predators such as bears, wolves and coyotes, beavers tend to do most of their business at night. Although you might see one occasionally during the day, a beaver usually stays in his den until the sun begins to set. Beavers sometimes come out during the day, but they tend to prefer the cover of night for their building escapades. The gather mud, sticks, branches and sections of tree trunks to create elaborate dams. These dams across rivers and streams cause the waterways to back up behind the dam. In the ponds created by the dams, the beavers build cone-shaped lodges that sit mostly underwater and include caverns and bolt holes -- both above and below the water line -- so they have a warm and dry place to live. Some beavers build bank dens instead, which are often burrows dug into riverbanks, reinforced with mud and sticks. When twilight falls as the sun begins to sink below the horizon, beavers start their nightly feeding rituals. 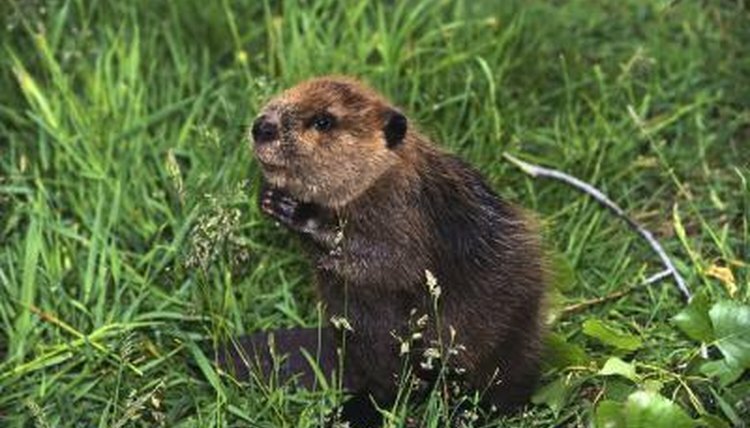 Beavers are herbivores that enjoy plants that grow in and near water, such as water lilies, grasses and clover. They like to gnaw on trees to remove the outer bark and eat the inner green bark, and they often strip the leaves off branches for a tasty meal. When they cut down trees, they are usually trying to access the leaves and other areas of inner bark. After stripping the tree, a beaver might drag it to the water to use as part of his dam if he's still building. A beaver might access his lodge or den several times during the night to bring building materials or extra food, but he usually forages off and on until the sun starts to come up. Beavers don't hibernate during the winter, but they know they must prepare for slim food choices when the cold weather hits. During the night, a beaver collects inner bark, stems, twigs and other vegetation in an underwater cache near his den. When he's not actively eating, he uses the cover of darkness to stock his cache. He anchors the food on the bottom of the pond with rocks or mud so it will stay in place until he needs it. The location gives him access through his dam's underwater entrances even when the surface of the water is frozen in colder climates. Beavers can relax a bit in the spring, enjoying the abundance of fresh vegetation that appears. In the fall, however, beavers start living up to their busy reputation. As summer comes to a close, beavers start building their winter stockpiles at night, in addition to their normal eating activities. They also spend part of the night hours shoring up their existing dams or lodges in preparation for cold weather. They are more likely to come out briefly during the day in the fall, especially early evening, to give themselves more time to gather food and materials in preparation for winter.